November 13, 2014 December 13, 2014 onebendintheriverLeave a Comment on WHY DID THE SNAKE CROSS THE ROAD? The most common way I see snakes around here is on the road. Sometimes alive. Sometimes dead, if they’ve been unlucky enough to meet with a car. On the cool, windy- but-sunny days we’ve been having lately, I’ve seen them quite frequently, probably because they’re too slow to be gone before I get there. They probably also like the heat of the gravel or tar. When Craig was collecting snakes in Central Australia years ago, we would go out at night looking for snakes keeping themselves warm on the black, sealed roads after the sun had gone down. 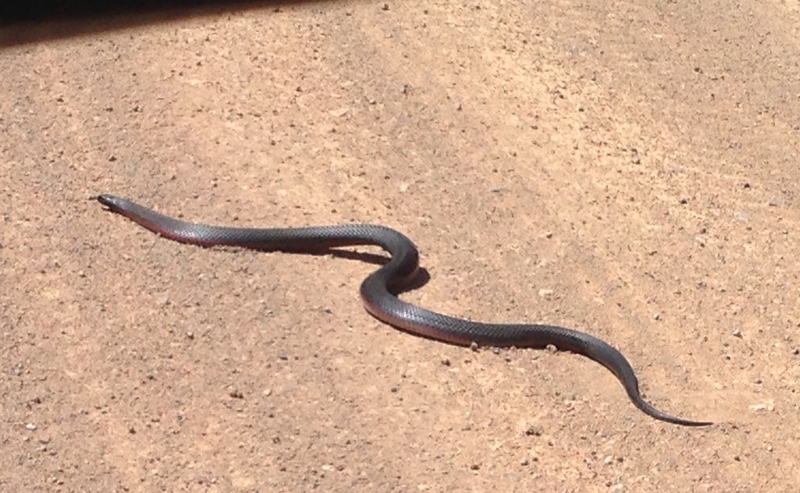 In 2012 I repeatedly saw one black snake crossing the road at the same place at the same time of day – from the river up into the steep revegetation area at the cutting. It usually went quite slowly until it noticed the car, then it would whip away much faster into the long grass. More recently we see them at Lizard Crossing (on Mullion Creek). Craig and I saw both a black and a brown at opposite ends of the bridge a few weeks ago. Again, near water. This red-bellied black was crossing our neighbour’s road between her dam and the riverbank in mid-afternoon. Initially it was going slowly enough for me to pull out my trusty iPhone, but it speeded up when it realized what was going on. It tried hiding in the shadows under the car. Not the brightest idea. Its red underneath looks as if it’s just reflection from the red gravel of the road. I wasn’t prepared to follow it into the long grass for a closeup, if I could even have found it. Peter Street, however, has beautiful closeups and fascinating descriptions of their behaviour at his wildlife blog. He has kindly given me permission to use one of his pictures ( above). Snakes that don’t make it to the other side are usually food for the meat-eating birds like ravens, magpies, currawongs and so on. Others may have a more undignified end. 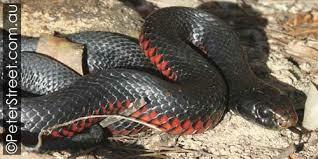 Our neighbour Lee was having trouble with her terriers attacking snakes. I’d suggested our ridiculous process with rubber snakes, but she had a lot more dogs and they’d been teaming up and doing it for years. So she picked up a dead snake from the road and wrapped it unobtrusively in part of an electric fence, then turned it on. Her ringleader terrier attacked the dead snake immediately and went away yelping. The other dogs watched and apparently got the hint. She’s keeping the snake (carefully bagged and marked) in her freezer in case her dogs ever need the electrified snake treatment again. Just a final note – I was pleased to hear that WIRES now has not just one, but three trained snake removers in the little community of Murrumbateman. That’s a big increase from zero a few years ago and may save many lives (the snakes, I mean).